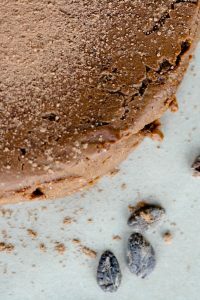 This dense and rich Flourless & Dairy-Free Chocolate Cake is certainly one of the easiest cake I have made. It contains very few ingredients that are all very easy to find, plus it does not require any baking. Not only is it flourless (and so gluten-free) but it is also dairy-free, refined sugar free, and oven-free! Not free of flavours though 😉. I hope you love dates as much as I do as I have used quite a few in this recipe. They are such a wonderful and versatile ingredient. 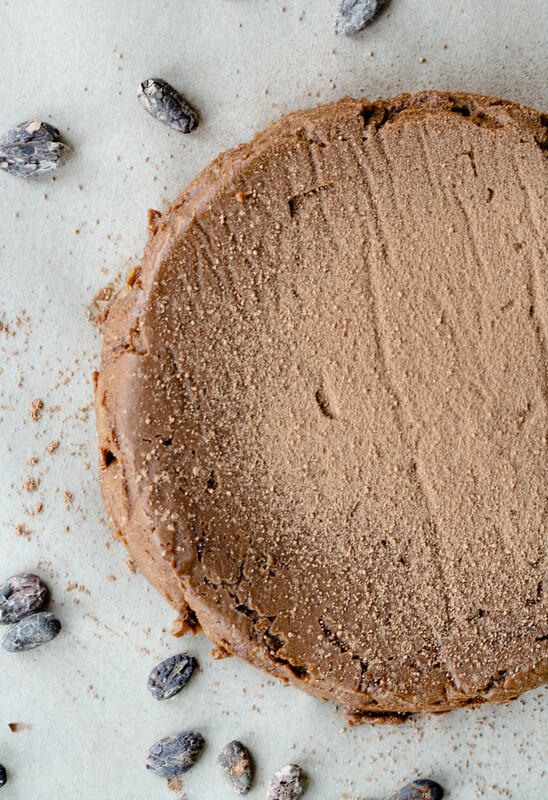 When in a rush I will simply have them on their own with a coating of cashew butter and sea-salt for a nutritious and on-the-go snack, but my favourite way to have them is baked into a cake such as a delicious Caramel Fondant or blended into this Flourless & Dairy-Free Chocolate Cake, for a sticky and dense consistency. Medjool dates are by far my favourites. Easy to blend, they will allow you to create a silky and smooth paste while their sweet and caramelised taste make them the perfect substitute to refined-sugar. Dates contain an array of health benefits that refined-sugar does not, they are a great source of vitamins, minerals, calcium and are full of fibre, acting as a natural laxative (as a result it is best to not overeat😉). Which Cocoa Powder should we use? 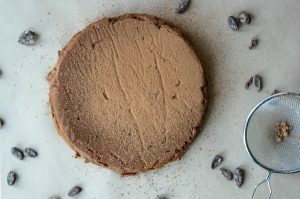 For this recipe I have used Dutch-processed cocoa powder, the acidity found in this type of cocoa (vs natural cocoa powder) has been reduced, making your bakes taste even more chocolatey. 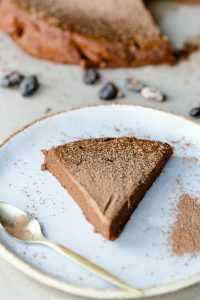 The first time I made this flourless and dairy-free chocolate cake I was so eager to taste it that I only left it in the freezer for 4 hours or so, which seemed like a long time! However, this isn’t enough and a good 10 to 12 hours is needed. The longer the cake stays in the freezer the better it will taste. This extremely smooth and indulgent Flourless & Dairy-Free Chocolate Cake melts softly as soon as it touches your tongue, with a rich chocolate flavour and delicate caramel notes, for a nutritious and delicious treat. Serving tips: take the cake out of the freezer no more than 5 minutes before serving. You could prepare this cake well before a dinner party or any other celebration and leave it in the freezer until you need it. Saving you some time along the way! 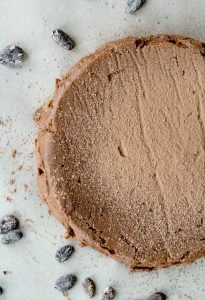 I hope you try and like this Flourless & Dairy-Free Chocolate Cake, if so let me know! Share on Pinterest and tag a photo on Instagram #mimies_delicacies so that I can see your lovely creations as well as helping me reach more of you lovely people. Merci my friends! 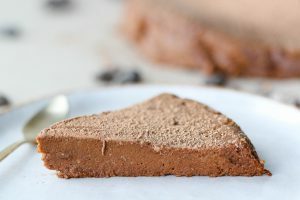 A dense, rich and creamy Chocolate Cake, that is dairy-free and gluten-free, very easy to make you do not need any oven. For all the chocolate lovers out there ! I have used a 8 x 8 inch (20 x 20 cm) round pan. Bear in mind that if using a bigger pan your cake will not be very thick. Alternatively you can also use a square pan. Melt the coconut oil into the microwave for 30 seconds. Slice the dates into chunks (if too dry leave them in a bowl of hot water for 10 minutes) and blend in your food processor until it becomes a paste. Add the pumpkin puree into the food processor along with the almond meal flour, maple syrup, cacao powder, sea salt, vanilla extract, melted coconut oil and mix until well combined. Line your cake pan with some parchment paper and place the mixture into it. Cover with cling and place in the freezer at least 10 hours before serving.